Published on Thursday, April 25, 2013. 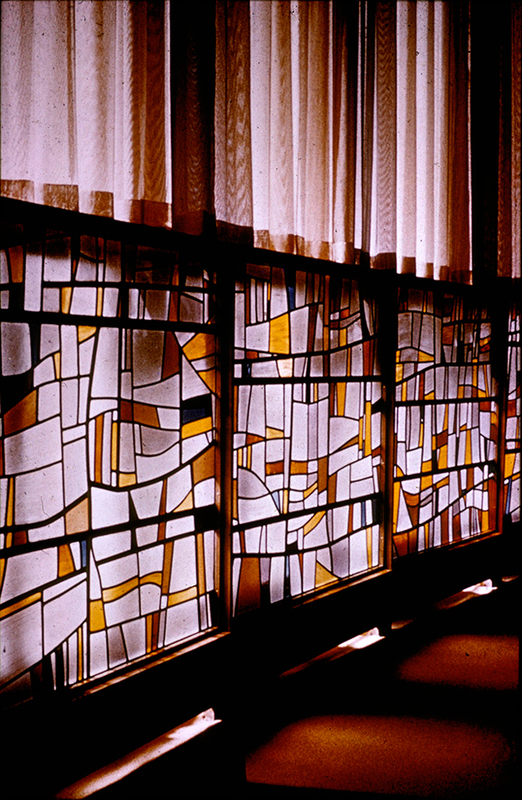 Stained glass (1958) installed at the Temple Mishkan Tefila in Newton, Massachusetts, by artist Robert Sowers. This image was based on the exhibition "Collaboration: Artist and Architect" held at the Museum of Contemporary Crafts in New York City from March 16 through May 13, 1962. One of the most notable early exhibitions at the Museum of Contemporary Crafts (MCC) in New York City was "Collaboration: Artist and Architect," held March 16 through May 13, 1962. Curated by MCC Director David R. Campbell, a trained architect, this exhibition sought to "foster closer relationships among all creative people who work together to produce an architecture truly expressive of our time." During the early 20th century many architects shifted focus to economic construction rather than artistic design, however, in the post-World War II era there was a resurgence of aesthetic collaboration between artists working in the decorative arts and those in the building arts. Campbell wanted to highlight this symbiotic relationship through an exhibit featuring works born out of artist/architect partnerships, including those of Constantino Nivola/Eero Saarinen, Robert Pinart/Percival Goodman, and Anni Albers/Samuel Glaser. Included in the exhibition was the work of stained glass artist Robert Sowers (1923-1990). One of the most prolific architectural glass artists of our time, Sowers completed hundreds of commissions, mostly for religious structures around the United States, during the course of his 30-year career. Perhaps his best known stained glass work is the 1957-58 glass facade he designed for the American Airlines Terminal at the John F. Kennedy International Airport in New York. At 22.5 by 317 feet, it was one of the largest stained glass windows ever commissioned. Incorporating his work into the design of a building was first and foremost on Sowers agenda. In his artist's statement from a 1975 solo exhibition at the MCC, he wrote "for me stained glass is first, last, and always primarily an architectural art." In addition to being an accomplished artist, Sowers was also a respected author. 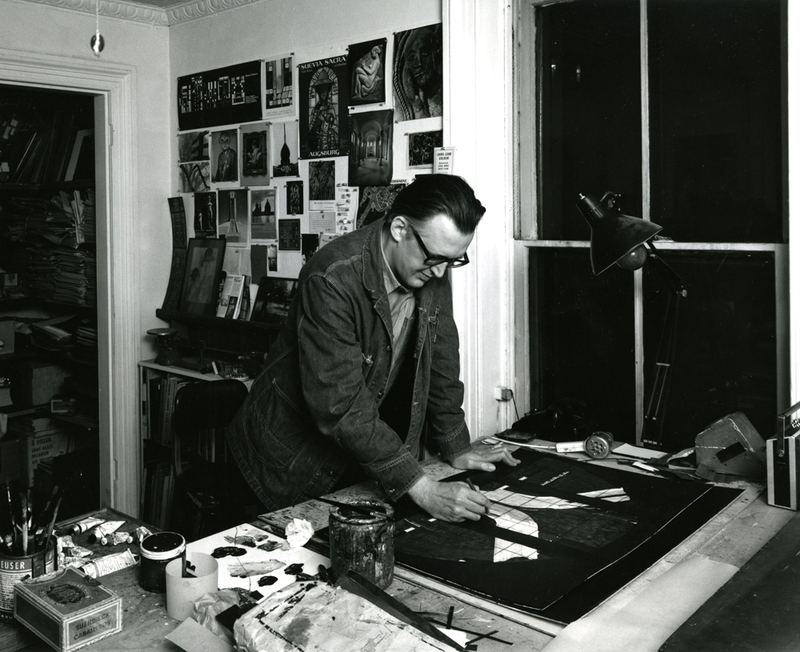 He wrote several influential books on stained glass including Stained Glass: An Architectural Art (1965), The Language of Stained Glass (1981), and Rethinking the Forms of Visual Expression (1990), which was published shortly before his death. His work lives on today through these resources and the continuing presence of his stained glass works in churches and synagogues throughout the country.